Last Couple of years in our country have been the time where lots of laws have been enacted to consolidate the economy system. Goods and Services Tax, Insolvency and Bankruptcy Code and Real Estate (Regulation and Development) Act, 2016 are the great examples of the recent developments. Insolvency and Bankruptcy (Code) and the Real Estate (Regulation and Development) Act appear to be hollowed against each other with regards to settling the interest of the bankers and homebuyers. 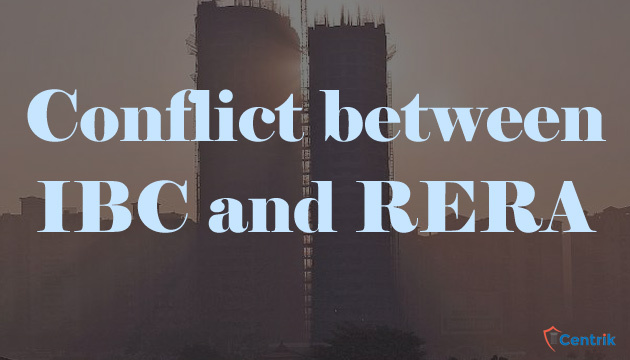 Both the IBC and RERA have the provisions where the probability for the conflict in their operations are very high. IBC allows companies to file their insolvency proceedings so that they can provide relief to the debtors or creditors and on the other hand RERA was implemented with the sole motive to bring the justice to the aggrieved home-buyers and penalize the builders or developers if the project is delayed. The conflict between IBC and RERA recently been noticed in few bankruptcy proceedings as the provisions of the IBC explicitly says that the Home-buyers are “Unsecured Creditors” so their interest should be settled after those stakeholders who have provided the loan to the Builder. Lately, in the Amrapali case the Hon’ble Supreme Court held that the Financial Creditors don’t have any right to take over the homes which belong to the home-buyers, it can clearly be seen that Supreme Court support the interest of the home buyers and put them ahead of the financial creditors. The fundamental contradiction between the provisions of IBC and RERA is evident as one is giving priority to settle the interest of the creditors and the other one is keenly put home buyers in the front line before the creditors. As per the experts in case of a conflict between IBC and RERA, IBC will prevail over RERA and if it happens then this is going to undermine the motive of the RERA for which it was enacted. The best way to intact the purpose of the RERA Act in such case that, the synchronization of the RERA provisions with the provisions of the Insolvency Act shall be there. At last, we can infer that though there is a contrast between the IBC and RERA provisions but the implementation of the RERA Act was the need of the hour as it will restore the faith of the homebuyers and in long run it is going to give us the organised and stable Real Estate market and simultaneously the IBC provisions are equally important to secure the interest of the creditors, but still the alignment of the provisions shall be done so that conflict between the two can be eliminated.